"Kind of like a Long Island iced tea, but with a blue twist!" 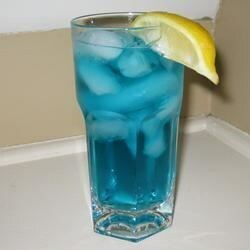 In a cocktail shaker filled with ice, combine the vodka, tequila, rum, gin, Blue Curacao, sour mix and lemon-lime soda. Shake vigorously to get a frothy head on the drink. Pour the contents of the shaker, including ice, into tall bar glass and garnish with a slice of lemon. See how to make a classic tiki cocktail with rum and blue curacao. Overall a great drink recipe. If only I had a motorcycle. This was really good--nice change of pace from a Long Island Iced Teas!